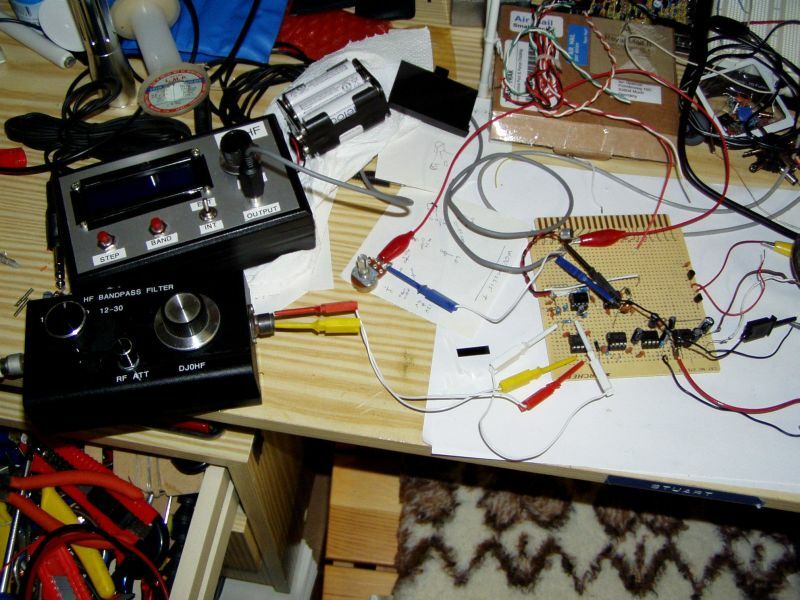 This project started as a Wee Willy DSB Transceiver for 40Metres which means it is a direct conversion receiver using an NE602 as the mixer. 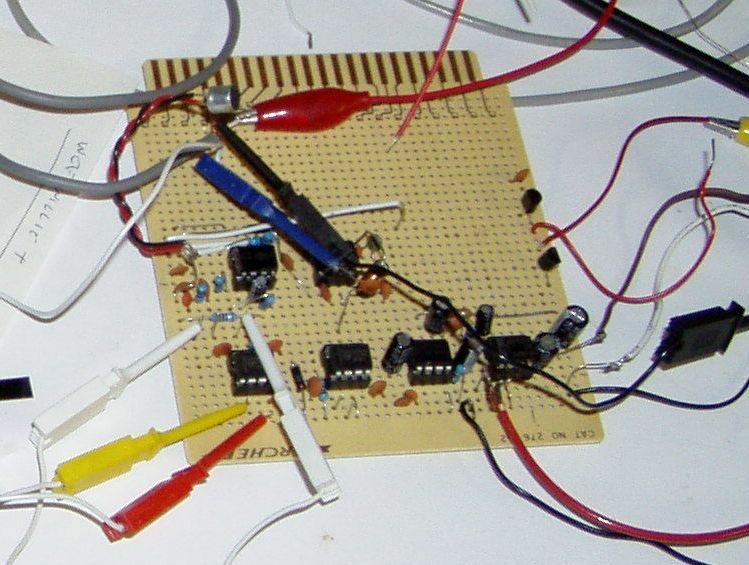 Mixing the signal from the antenna with the signal from the local oscillator to form an audio signal which is then amplified by the LM386 audio amplifier. On the transmit side there is a 741 op amp as a microphone amplifier feeding an NE602 to create a DSB signal which is fed to the transmitter amplifier stages. In this photo you can see the Wee Willy and to the left the DDS VFO used to produce the Local Oscillator signal and below that in the black box a selectable Band Pass Filter for 1.5 to 30Mhz. However after getting the basic receiver working I decided to change (Improve ?) the receiver. Here you can see a close up of the Transceiver circuit board. The two chips at the top are the 741 microphone amplifier and you can see the electret microphone on the end of the red and black wires and this feeds the NE602 mixer. The receiver is somewhat modified because although the basic Wee Willy worked on 40Metres I wanted the receiver to cover all of the amateur bands from 160 to 10 Metres. and the Wee Willy wasn't very sensitive on the higher HF bands. I tried a number of transistor RF amplifiers in front of the NE602 Receive mixer but none of them worked particularly well and then I saw a circuit by VK3AWC which used an NE602/NE612 as a Receive preamplifier and you can control the gain by feeding a voltage onto pin 6 of the 602. It worked a treat and so in the line up on the left is the NE602 receive preamp then the NE602 mixer followed by the LM386 audio amplifier and as I wasn't happy with the maximum audio available I added my favourite chip the LM380 on the right to boost the audio to 'Very Loud'. All this audio gain allowed me to put a simple resistive/capacitive audio filter between the 386 and the 380 to limit the audio response and give a passband of about 3Khz which worked fine for SSB but as you will hear in the recordings a number of CW stations can be heard at once. But I do have a CW filter to fit which will solve this problem. As you can probably see the receiver isn't very large being just 8cm x 3cm in size. The transmitter isn't finished yet as I still have to add the RF amplicier stages, but if you would like to hear the receiver working on all bands from 160 to 10 Metres then an MP3 is included below.